After 13 years in our house, the basement was finally dry—or as close to dry as it was ever going to get. The walls weren’t fancy, but they were clean and white (and did I mention dry?). We weren’t prepared to spend many thousands of dollars on a true finished basement; we just wanted it usable. But to do that we had to tackle the floor. 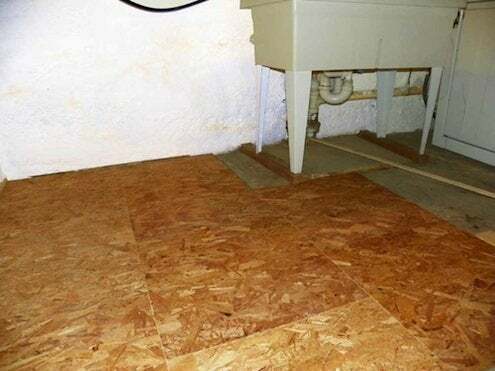 The concrete floor was not only unsightly, with cracks and discoloration and remnants of a previous owner’s misguided tile job, but it was also a hazard. Knowing the ninja warrior games and gymnastics moves our kids and their friends favor, we knew that concrete wasn’t the best solution. Since we do still have minor water seepage every so often, we’d have to take that into consideration. 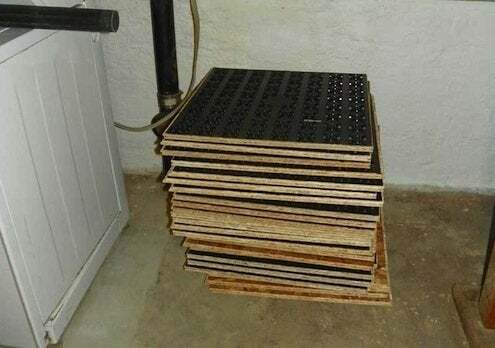 I thought about laying a plywood subfloor, with a 1×2 grid raising it enough to keep it from getting wet and also providing a little “give” for when young heads fell on it. But what material for the grid? Anything I put down would occasionally be sitting in a quarter inch or so of water. I had visions of mold and mildew, rotting wood, even termites (yes, we’ve had those, too). In search of inspiration, I came upon a Canadian product called DRIcore. 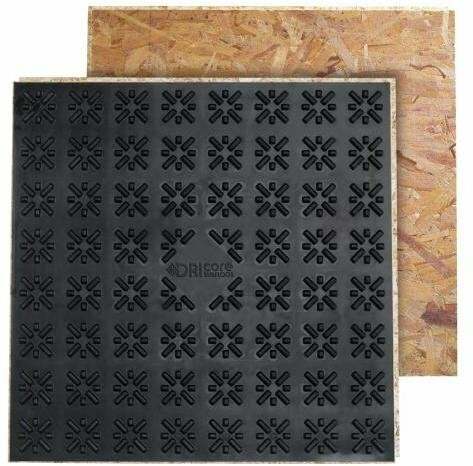 It consists of 24×24″ tongue-and-groove panels with a vapor barrier on one side. 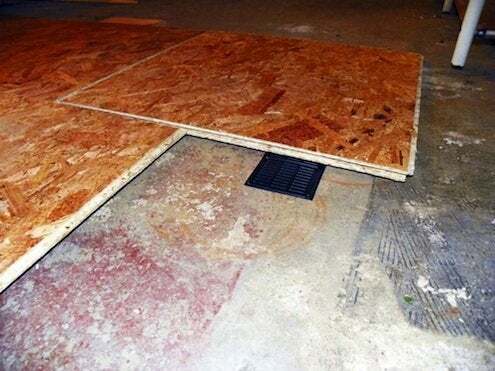 That side also features little “feet” that raise the panel off the floor and allow air to circulate and any moisture to evaporate (via a quarter-inch gap around the room’s perimeter). I was intrigued. I read the company’s literature and watched its how-to video. I looked online for consumer complaints or horror stories but didn’t find any. 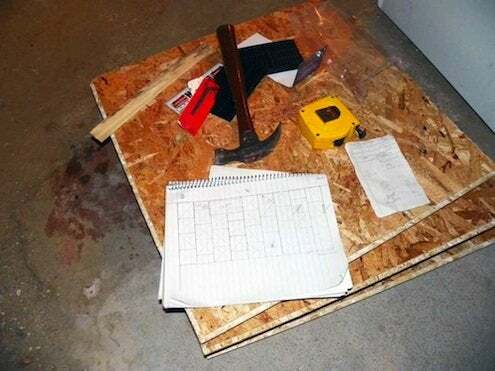 The product has been featured on a Canadian home improvement show, it looked easy to install, and it seemed to be precisely what I’d had in mind when I envisioned that plywood-on-a-grid solution. Still, at almost $6 a panel it’s not exactly a cheap solution, so I decided to test it in the laundry area (just under 150 square feet). I bought 44 panels and a package of matching shims, which the literature said would help even out any irregularities in the surface (and we certainly had some of those). I also bought a couple of tubes of self-leveling cement filler, which could be used with a caulk gun. I’d need this to fill any depression of more than a quarter-inch. And although it’s not an especially cost-effective way to do that, it’s mighty easy. With the filler curing and the panels acclimatizing, I had 24 hours to figure out my final plan of attack. I watched the how-to video one more time, then created a scale drawing of where the panels would be positioned and where I’d have to make cuts around pipes, posts, and stairs. The next day I went to work. And son of a gun, this job is as easy as promised. Granted, if my basement were as clean and level (and empty) as the one in the video, I probably wouldn’t even be doing this job. But the panels join together pretty easily, and with each panel measuring four square feet, the open areas get covered fast. Cuts are easy to make with a jigsaw (the video shows a circular saw, but I’m more comfortable with a jigsaw, and it works better for those curved cuts around pipe anyway). The literature says you can install about 100 square feet an hour. I took a little longer than that, but the work still went pretty fast. I did the laundry area in no time at all and headed out again for more panels and shims.